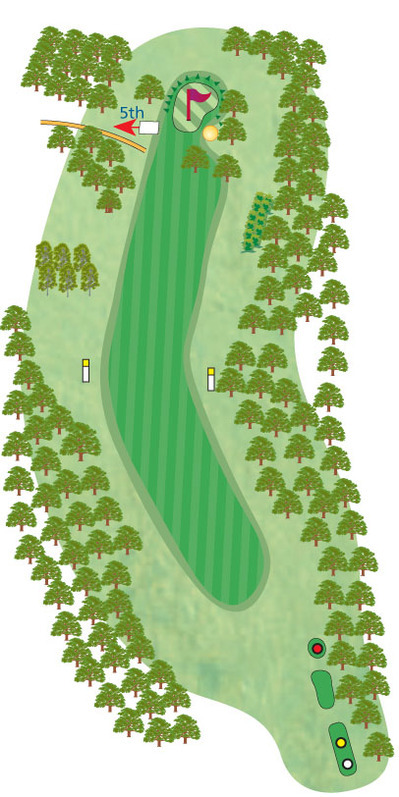 If your ball comes to rest near a tree, you can elect to take a penalty drop. Mark the position of the ball and mark a point two club lengths from it which is no nearer the hole. When you drop a ball you must stand erect and hold it at shoulder height and arms length (rule 20-2a). Drop your ball between these markers. 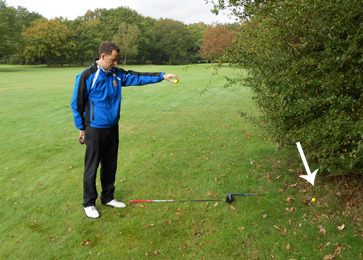 Note; you cannot drop it on a spot that is nearer the hole or outside the markers (rule 20-2b). The ball is in play if it comes to rest within two club lengths of the point where it landed when you took the drop (rule 20-2) and is no nearer the hole. If it rolls more than two club lengths or is nearer the hole, it must be redropped (rule 20-2c). If you drop the ball twice and it rolls more than two club lengths from the point where it landed when you dropped it,or is nearer the hole, you must place the ball on the spot it hit the ground the second time you dropped it (rule 20-2c). Your ball is in an animal hole or scrape. is on an animal hole or scrape. The animal hole or scrape interferes with your normal swing path. See Hole 2 for guidance on how to take a free drop.